I relish the idea of diversity and change simply because both I believe brings growth and increase into my life. I am constantly looking for those opportunities whereby I can follow my heart and my passion to digress into certain areas and to experience the results. Mark you, not all changes will bring about good results. The word of God has made that very clear in Proverbs 16: 25 (NIV) saying, "There is a way that appears to be right, but in the end it leads to death." Not necessarily a physical death, but more so a spiritual one. But here are some of the good about diversity and change that I speak of. Diversity and change are a great combination if you are looking for growth and increase in your life. We should never stick to the idea that diversity is only about how we differ. It is far more than that. It's about embracing each other's uniqueness, celebrating one another as an extraordinary masterpiece of the Creator whose picturesque pageantry of the beauty of His creation lies around us and we as a piece of that diversity, gets one chance only to exist here upon this earth. We are talented and gifted in our own way to complete one another, and not to compete against each other. We are equal in value to our Creator, no matter the color, yet diverse in our genetic characteristics, and our leadership and management styles. We are diverse in the rich culture that exists, in the language we speak and our opinions on so many fronts in life. Diversity is a pricless quality that each one of us possess whereby we can think independantly, yet through some unspecified artistry, we are able to merge those thoughts and ideas as if it was done together. Diversity removes stagnation from our lives and I believe that life would not be as interesting as it is of we hung with the same type of people everyday. 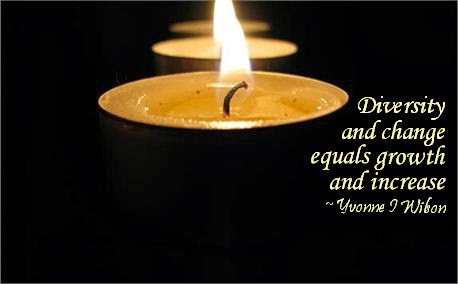 Diversity creates balance as we allow for our differences and individual creativity to articulate the mind of our Creator. It's an indication and a mark in society that a healthy democaracy exist. That we can be diverse and different, and not get into a fist fight with the other person. This I believe is a win-win situation. As some of you may already know, I have three biological daughters. I love them very much and they are near and dear to my heart. They are so different in their thoughts, ideas and their ways, hard to believe they share the same dad and they came from this one mother's womb. They have different sense of style and fashion. Their food choices are different in many ways and so life around the house from as far back as when they were in my womb has been very interesing. They have different ideas as far as their career path and goals in life. The diversity shared among us is one that I would not ever do a trade off with because it's our identity. So there we go, diversity becomes our identity, a requirement I believe for survival. Diversity should strengthen and unify us a people rather than weaken and divide us. And since it is the one thing that we all have in common, it is time that we celebrate it every day. 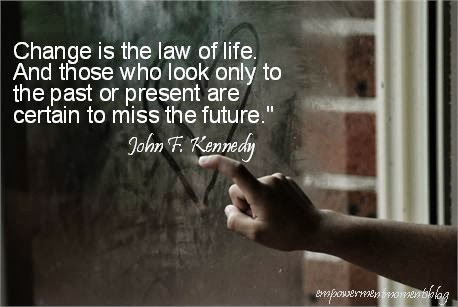 It was John F. Kennedy that once said, "Change is the law of life. And those who look only to the past or present are certain to miss the future." Often times, the reason we are not quick to make and embrace change/s in our lives is because we lack the courage and we are too afraid to do so. Tradition will never motivate or encourage us to change and so we bury ourselves in a particular modus operandi, and some even live by the rule of thumb, 'if it ain't broke, no need to fix/change it.' Soon however, we realize that once we let go of the fear, we are called into action and making some very basis changes in our lives, result in fruit bearing, increase, strength and growth in areas of our lives. Be willing to develop a culture of susceptibility to change, that even if you cannot change something, you can without an external pressure, change the way that you think about it. Change must always be viewed as a constant in our lives. It is one thing that is certain. Seasons change. People change. Systems and policies change. Governments change. Friends and family change. Even when you marry your childhood friends, years later down the road, you witness them changing before your very eyes. Our past will never change and it is already archived into the pages of history. We cannot change the fact that some of our most trusted family or friends will act and behave in a certain way. But you and I have control and we can play on the one thing that we have and that is our change dial called, attitude. One day I got up and realized that I would be making a fool of myself to think that I could change and alter the chaos that surrounded me. I could not change the inevitable nor the variables that were necessary for building my true God-like character. I also knew that I could not change the minds of the people who pushed me aside and rejected me, but I had control of my thoughts of who I am in God and that I could cast down all of the wicked imaginations and intents that were being directed towards me. The purpose for which you and I were created has not changed. The course of our destiny (future) was and still is in the hands of God Almighty. But the changes that would bring growth and increase to each of our lives, means that our attitude have to remain positive at whatever cost. Let go of your fear, it is the key in your hands to change. Hope you like today's column. Leave a comment, leave your reaction and share with someone else to bless and inspire them today.